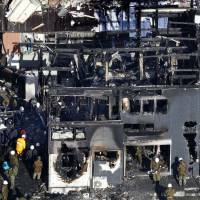 A Ground Self-Defense Force helicopter was on a test flight after having its main rotor replaced when it crashed into a home in Saga Prefecture, killing the two crew members, Defense Minister Itsunori Onodera said Tuesday. Onodera said that in addition to a regular 50-hour inspection, the aircraft had its main rotor head, which connects to the blades, replaced before the flight. “We are still looking into the cause of the incident,” Onodera told reporters in Tokyo. Police resumed Tuesday morning searching the site where the AH-64D attack helicopter crashed into a two-story home in the city of Kanzaki at 4:43 p.m. on Monday. 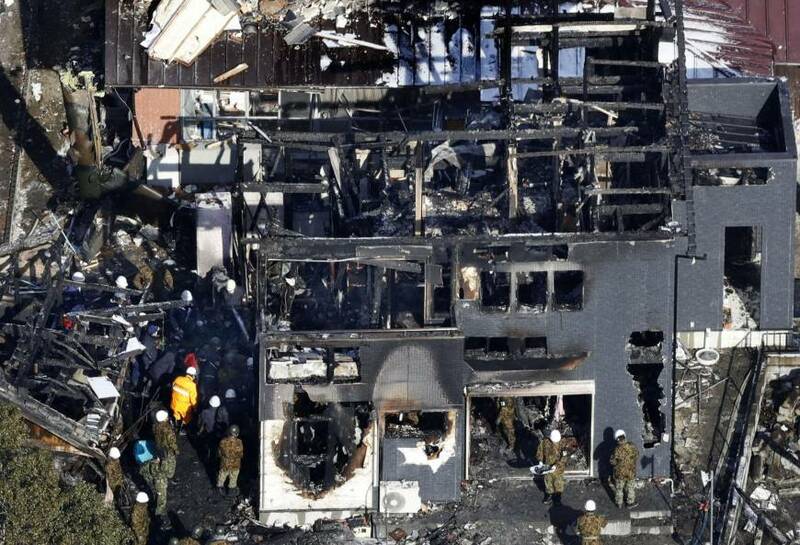 The dead were identified as pilot Kenichi Saito, 43, and copilot Hiroki Takayama, 26. The home, which belonged to a family of four, was engulfed in flames after the impact but an elementary school-aged girl who was alone inside at the time managed to escape, suffering only a minor knee injury. Her grandmother was inside an adjacent house that was partially damaged by the fire, but she too escaped safely. According to the Defense Ministry and the GSDF, the helicopter was cleared to take off from the GSDF Metabaru Camp at 4:35 p.m. on Monday. It flew about 6 kilometers before crashing. Flight controllers had communicated with the helicopter two minutes after take-off, but no abnormalities were reported, a GSDF official said. The controllers later confirmed they could see smoke rising in the distance in the direction of the helicopter’s path. According to Onodera, the main rotor heads of AH-64D helicopters need to be replaced after 1,750 hours of flight time. Experts on Self-Defense Forces aircraft speculated that a mistake during the maintenance work is likely to be behind the crash. Some residents in the area reported seeing the main rotor become detached in mid-air.